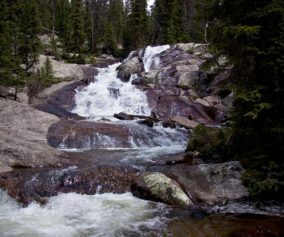 Horseshoe Falls in Rocky Mountain National Park is a favorite family hike near Estes Park, Colorado. 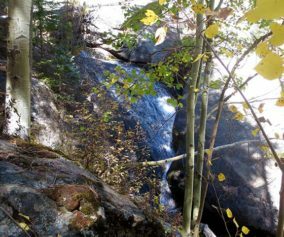 It’s a short and easy hike from the Alluvial Fan Trailhead, but the falls can also be viewed from the roadside. It’s an extensive cascade waterfall, named for the way it bends its course through the rocky hillside. 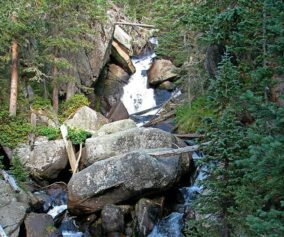 Explore the full Horseshoe Falls hike profile below for trail map, driving directions, and more tips and details to help you enjoy this adventure in Rocky Mountain National Park. 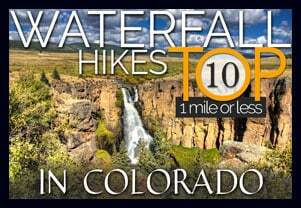 Horseshoe Falls can be accessed just outside Estes Park, Colorado by taking Fall River Road to Old Fall River Road. The East Alluvial Fan Trailhead is approximately 1/2 mile up Old Fall River Road, and the West Alluvial Fan Trailhead is just about 1/4 of a mile further. Because Horseshoe Falls is popular destination in RMNP, the parking fills up fast. There is an additional parking area just before reaching the East Alluvial Fan Trailhead, see this link for driving directions and map. 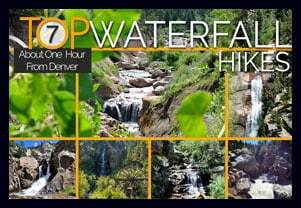 This short hike to Horseshoe Falls got even shorter because of the 2013 flooding in the Estes Park and Rocky Mountain National Park area. As of this writing (6/30/2016) both the East and West Alluvial Fan Trailhead parking areas have reopened. However, the trails are still buried under rock and debris, and the bridge–which used to be a great viewing platform for Horseshoe Falls–has not been replaced. This doesn’t mean a short hike up to the base of the falls is impossible, but it does require a some care in navigating the terrain. 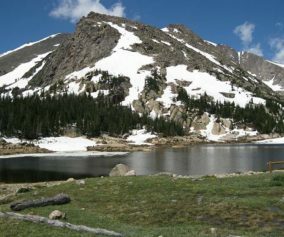 The official RMNP communications ask hikers first consult posted signs or speak with a park ranger before making the trek. As with all off-trail hiking along rivers, it’s important to exercise caution near fast moving water and on the surrounding slippery surfaces of rocks and logs. When the trail is repaired (assuming that it will use the same route), the Alluvial Fan Trail can be hiked from either of the two lots to the bridge viewing area, which is just under 1/4 mile one-way. Horseshoe Falls and the larger Alluvial Fan area have an interesting history. Before the establishment of Rocky Mountain National Park, a twenty-six foot high dam was built to enlarge Lawn Lake, which is located about 6.5 miles north of Horseshoe Falls and a major source of the Roaring River. On a perfectly normal day in the Summer of 1982, an almost 100 foot stretch of the dam collapsed and sent a 30-foot high wall of water careening down the valley. 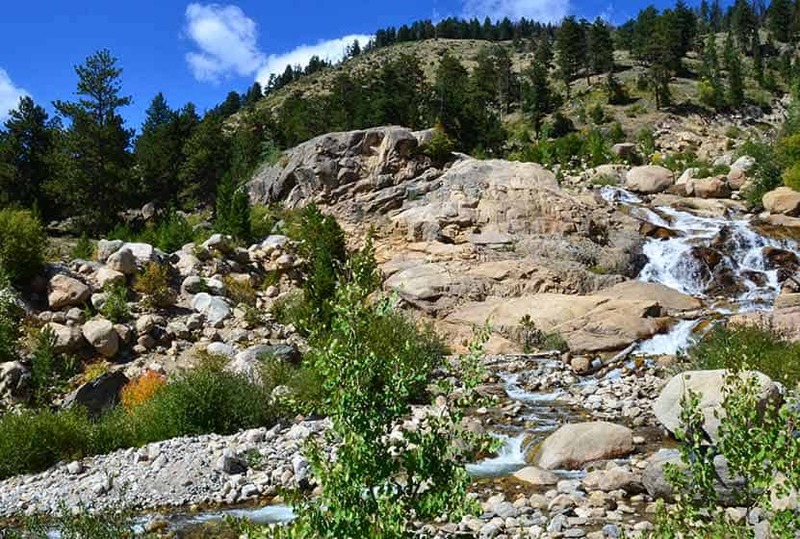 At Horseshoe Park, much of the wash settled into what is now known as the 42 acre Alluvial Fan, comprised of sorted gravel, boulders–some over 400 tons–and streams of sand. Three people lost their lives in the flood, one camper, and two folks who had ventured out to capture photos of the event. The river surged all the way into the downtown of Estes Park, carrying away trees and cars, and breaking through another dam before being contained by Lake Estes. 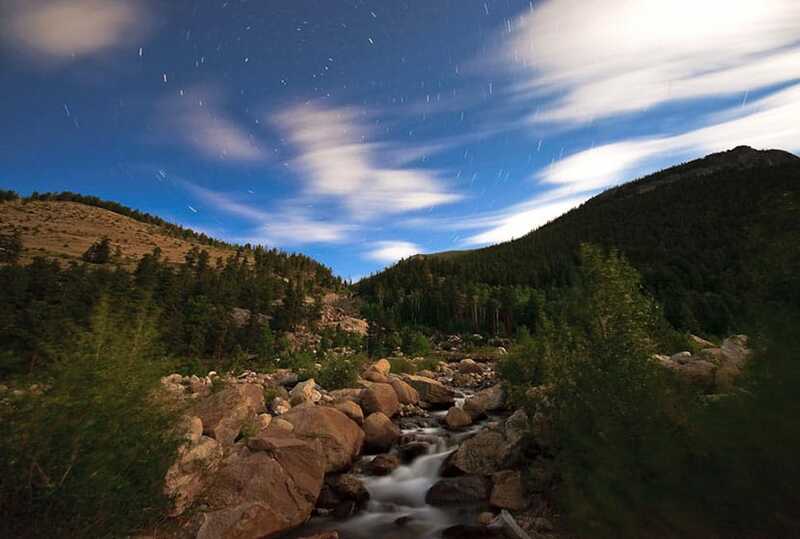 For Closure Updates: See the Rocky Mountain National Park Flood Impact and Closure page for updates on the conditions of this trail. 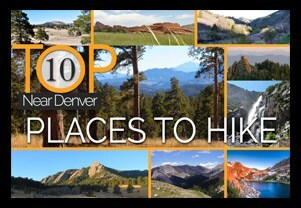 TIP: The Alluvial Fan and larger Horseshoe Park area are popular spots for viewing Elk. Photo: We would like to express our gratitude to Joan Morris Holzer for sharing such an amazing photograph of this hike to Horseshoe Falls in RMNP.